Apparently, tubes aren’t just for toothpaste and tomato purée. Who knew?!? 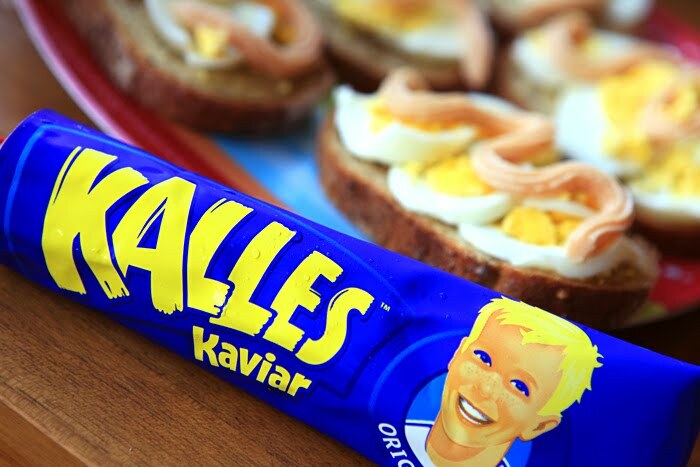 You can find a plethora of different food goods in tubes in Sweden ranging from the logical mayonnaise to the unexpected caviar. You’ll also find huge selections of soft cheese in tubes with flavours including shrimp, chorizo and reindeer. Above you see the culprit of many screwed up, displeased, and likely foreign faces – Kalles Kaviar. Light pink caviar in a tube with a distinctly fishy smell and flavour. Even their advertising is aware that not everyone is a fan of their products. Effectively the Marmite or Vegemite of Sweden. Picture a decadent layered cream cake…but savoury. Layers of bread with large amounts of fillings and garnishes. This very popular dish often shows up at parties and celebrations and appears to be a crowd favourite. It’s served cold and normally cut and dished up like a large cake. You’ll normally have the options of a shrimp or roast beef version. Personally, I’m not a huge fan due the large amounts of mayonnaise used but I can see why others love it. Now I absolutely love traditional food, especially Italian, but the pizza here is far from traditional. I’ve heard that they seem to have a similar approach in Denmark too but haven’t witnessed it first hand. At your local pizzeria expect to find items such as the Africano (chicken/ham, banana, peanuts and curry spices), La Polisen (pork fillet, onions, garlic and bearnaise sauce) and the almighty Kebabpizza med vitlöksås (yup, that’s with kebab meat and garlic sauce), just to name a few. They also typically come with “pizzasallad” – a simple little salad made of white cabbage, vinegar, pickled peppers, black pepper and a little oil which is eaten on top of the pizza. Now these may sound crazy, especially if you have some Italian blood, but don’t turn your nose up too quickly. Some of these combinations are simply spectacular. This kinda sweet, kinda savoury, kinda juice, kinda soup is a thing of beauty. You can have it as a soup or as a breakfast juice, both delicious in their own right. And the moment that I found out what nyponsoppa really was a big smile showed up on my face. Wild rose hip! That may sound weird but the reason this brought a smile to my face is that all through my childhood these plants were a pain in the arse for my brother and I in our house in Wales. We had a huge overgrown area full of these bushes and our footballs, rugbyballs, whatever, would always manage to end up in the middle of their thorny asses. Numerous scratches and grazes were received every time we had to crawl through the roots. So it’s nice to be able to finally appreciate this plant. 5. Now which dairy product did I need again? Mjölk (milk 3% fat), mellanmjölk (semi-skimmed milk 1.5% fat), lättmjölk (skimmed milk 0.5% fat), minimjolk (skimmed with 0.05% fat), gammaldagsmjölk, smaksattmjölk, yoghurt, filmjölk (sour thick milk), fil, fjäll, lättfil, smaksattfil, a-fil, naturell yoghurt, smaksatt yoghurt, drickyoghurt, kvarg, smaksattkvarg, kvargyoghurt, grädde, matlagningsgrädde, vispgrädde, kaffegrädde, mellangrädde, dessertsgrädde, spraygrädde, gräddfil, creme fraiche, havre/soja/ris-dryck…yup. Now this selection is more than impressive once you get past that initial confusion. A new discovery for me was Kvarg, a fresh dairy product which is part of the curd family. According to Wikipedia is can be classified as a “fresh acid-set cheese” although is also seen as a fermented milk product. You can get flavoured Kvarg, think blueberry or raspberry, and effectively have it as is for a breakfast dish or snack. It’s similar to having a yoghurt but a lot heavier and more filling. Now I’d never heard of this food group before, and apparently it’s English translation is “quark”. That may have something to do with the lack of awareness. What the quark?!? That’s it for now. If I’ve missed something that I really shouldn’t have, maybe it’s over at my other post. If not, be sure to let me know in the comment section below. And tell me about your experience with Swedish cuisine, both good and bad. Vi ses! You really hit the nail on the head, loove this post! Tack så mycket Anna! Glad you thought so. I assume that you’ve encountered Svensk mat then? So apparently there's a vineyard in Skåne. Who'da thunk it?